Noam D. Elkies is a professor of mathematics at Harvard and the youngest person ever tenured at the university. His research on elliptic curves, lattices, and other aspects of the theory of numbers has been recognized by such prizes and awards as the Presidential Young Investigator Award of the National Science Foundation and the Prix Peccot of the College de France. His work in mathematical exposition and teaching was recognized by awards from the American Mathematical Society and the Mathematical Association of America, and Harvard's chapter of Phi Beta Kappa. He currently holds several records for ranks of elliptic curves and related Diophantine questions. Alongside his mathematical career, Elkies has been playing the piano and composing since the age of three. 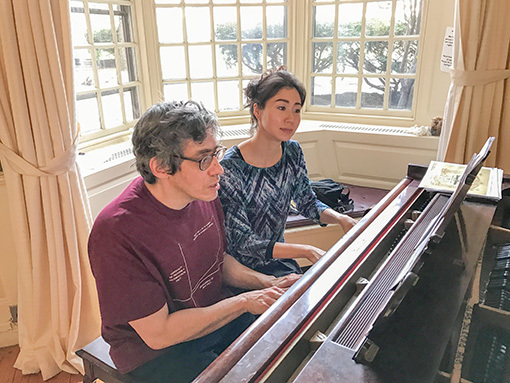 Born in New York, he studied piano with A. Vardi in Israel and with J. Carlson at Juilliard Pre-College after returning to the United States in 1978, where he graduated with highest honors in 1982. His composition teachers include Sadai, Davidovsky, and Kirchner. Solo performances include Bach's Brandenburg Concerto #5 with the Metamorphosen Chamber Ensemble, and Elkies' own Rondo Concertante, with the Greater Boston Youth Symphony Orchestras' Repertory Orchestra in Boston's Symphony Hall. His compositions, often but not always in styles that recognizably flow from traditional idioms, range from short character pieces for solo piano, to the "Brandenburg Concerto #7" premiered by Metamorphosen, to Yossele Solovey, an opera staged in 1999. His "E Sonata" for flute and piano is included in Alice Dade's "Living Music" CD released by Naxos earlier this year. Elkies is also known as a solver and composer of chess problems, and won the World Chess Solving Championship in 1996. Young Hyun Cho is currently an associate professor of piano at Michigan State University. Prior to this she was an associate professor of piano at the University of Texas at Arlington. She received her doctor of musical arts degree from the Eastman School of Music, her master’s degree and graduate performance diploma from Peabody Conservatory, and her bachelor’s degree from Seoul National University. Her piano concerts have taken her around the world. She has performed in Austria, Belgium, China, Germany, Italy, Korea, Malaysia, Spain, Thailand, and throughout the United States. Recent reviews on her piano playing include the Aachen Zeitung of Germany: “Hohe Kunst aufden Tasten” (High Art on the Keys). She has performed as a featured soloist with the Korean Broadcasting System (KBS) Symphony, Seoul National Symphony, Korean Symphony, Daejeon Philharmonic, Eurasian Philharmonic, International Chamber Ensemble of Rome, Eastman Symphony, Holland Symphony, New Philharmonic of Irving, Northeast Symphony, and University of Texas at Arlington Symphony Orchestra. Professor Cho has garnered numerous awards and accolades in music competitions, including the Virginia Waring International Piano Competition, Louisiana International Piano Competition, Harrison Winter Competition, Eastman Concerto Competition, Korea Musicians Association Competition, JoongAng Times Music Competition, Seoul Arts Center Orchestral Festival Competition, and KBS Music Competition. She has given performances and master classes at venues such as the Piano Texas International Academy and Festival in collaboration with the fourteenth Van Cliburn International Piano Competition and many universities throughout the United States; Minimes Music Festival Brussels and Korean Cultural Center Brussels; Schlosskapelle Zitadelle in Jülich, Ruhr University Bochum, Regensburg University, and other venues in Germany; Istituto Musicale Luigi Boccherini in Lucca, Palazzo Biscari of Catania, and other venues in Italy; Centro de Ciencias de Benasque Pedro Pascual; the IUGTE International Conference in Austria; Seoul Arts Center Concert Hall, Sejong Grand Hall, Seoul National University, Yonsei University, and Busan National University; University-College Sedaya International in Malaysia; Goethe Institutes in Korea and Thailand; China Conservatory of Beijing, Xinghai Conservatory of Guangzhou and other venues in China.